ohio is an exciting place to be today! i voted bright and early this morning while my family slept. max was so happy to see my sticker when he woke up. he's been so curious about the political process this year--asking loads of questions...watching the debates. we don't talk about where matt and i lean politically this year...not just yet. it's much more fun to see max make up his mind on his own...learning the process before partisanship! he spent the morning trying to guess who i cast my ballet for-- "did you vote for a boy?"... "is he already president or does he have fancy hair?" happy happy election day, friends! Haha! That last question made me laugh. So cute. Thank you for not pushing a political agenda here by letting your readers know who you voted for. That is soooooooo appreciated by this faithful reader. You are a class act, Miss Katie. Hooray for Ohio voters! You are the best & Max's question is oh so cute. It's nice that he's getting a chance to watch and decide for himself. Parents could all do a lesson to teach their children like that. Ha! I love Max's guessing clues. I think I'll do the same for my kids next time (since one hasn't been born yet and the other just turned 1, neither is very interested yet) although both my parents, my husband, and myself are voting for 4 separate candidates. haha fancy hair, that made me laugh out loud! so cute. and i have to vote after work- i'm dreading to see what the line will be like at 6:00-eek! All parents should take after that idea, bravo! that is so sweet! PBS had a show on this afternoon about voting (daniel tigers neighborhood). the kids voted on whether to go to the aquarium or the zoo. it was a good conversation started with my kiddos. I think its great that you're letting him figure it out for himself! That's too cute! I also love that you encourage him to keep an open mind by allowing him to form his own views. you, your outfit, and that sticker are all too stinking cute! loves!! "does he have fancy hair"
Haha, fancy hair. That's some pretty smart parenting, right there. I may have to follow your lead once I have kids. happy election day to you too! the questions he asked are so cute! Haha, does he have fancy hair?! I like that. Got me to laughing. oh my gosh... the fancy hair comment is too good! oh Max, I love you! Seriously, Ohio is such a big state when it comes to the elections. My county (Stark) was one of the last to get the results. Craziness I tell ya. "or does he have fancy hair?" - hahaha! he is too funny. 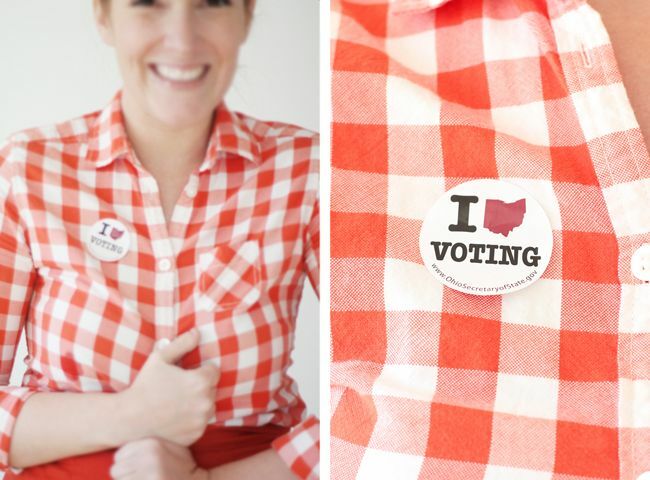 As a fellow Ohioan I got the same sticker! My 6 year old girl informed me that the one with the "crazy hair" was not serious enough to be president. Plus, I think she has a bit of a crush on Obama. HA! Just discovered your blog and i am in love- simple and sweet with beautiful photography! Thanks for the inspiration! The Ohio sticker is clever. Upon learning he was not an option she decided she would settle for "Rocco Bama."